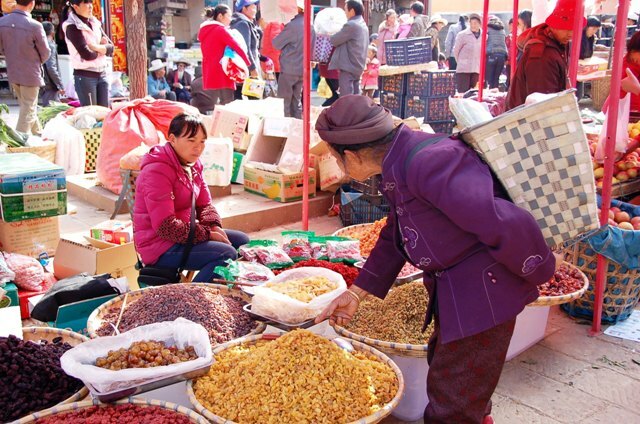 The Shaxi Friday Market runs … well … every Friday, from the morning to mid afternoon. 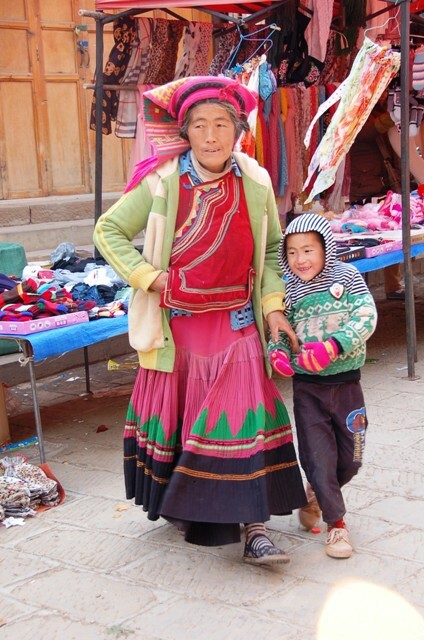 The town itself (pronounced “Shasee”) lies midway between Yunnan Province’s larger cities of Lijiang and Dali. But it makes up in significance what it may lack in size. 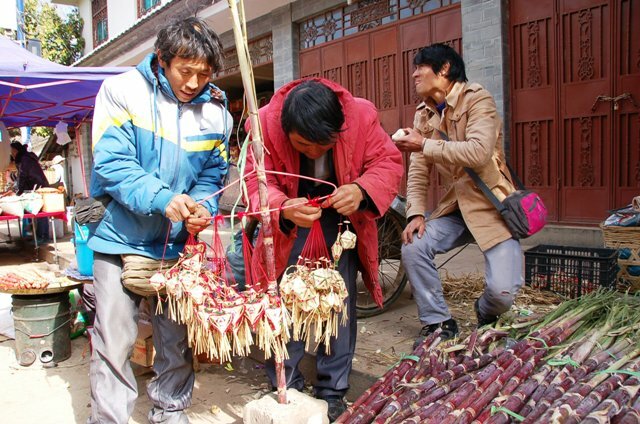 It is here that the most complete, surviving trading center for the famed Tea Horse and Caravan Trail takes place every Friday in the form of Shaxi’s Friday Market. 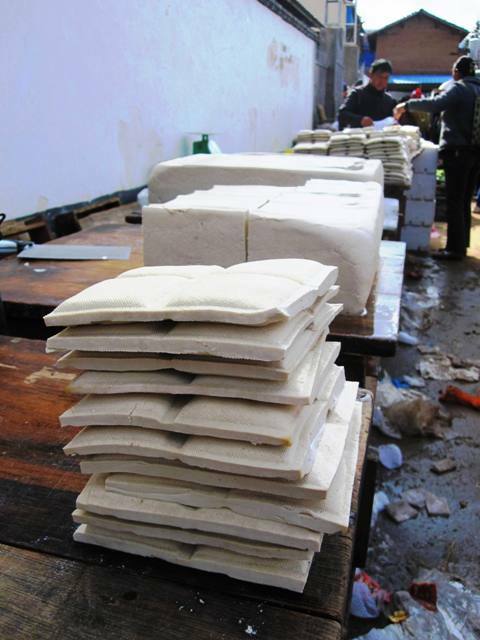 It is believed that tea was first introduced to the world through this Tea Horse route, starting with tea harvested from China’s Yunnan Province and then packed into bricks and carried (along with salt) on the backs of mules to Tibet, then to Burma and India. 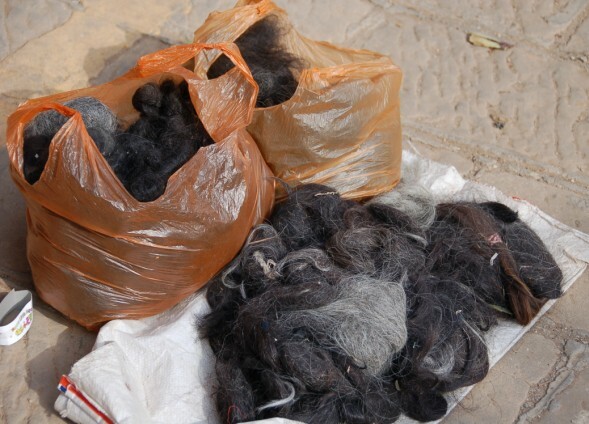 Along the way, Tibetan ponies were sometimes traded for the tea (or salt), hence the name. Another interesting point? 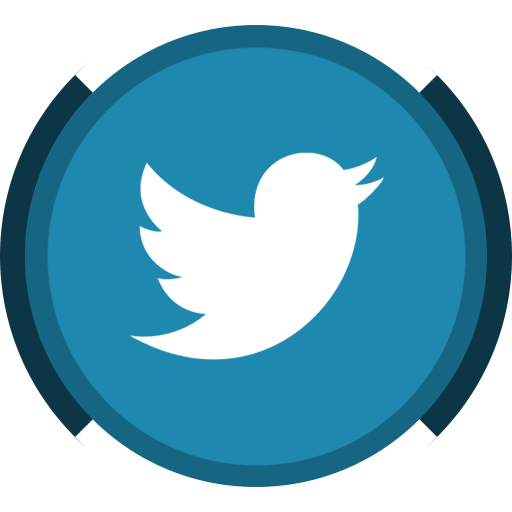 The Chinese name for “salt” is “Yán” but when spoken, it sounds just like “Yen” as in, Japan’s currency. 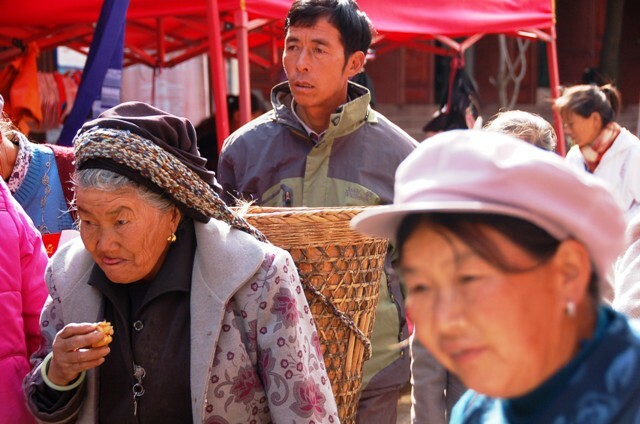 And while traditional caravans may not be spotted anymore, Shaxi’s Friday market still offers a taste of what it must been like a thousand years ago. 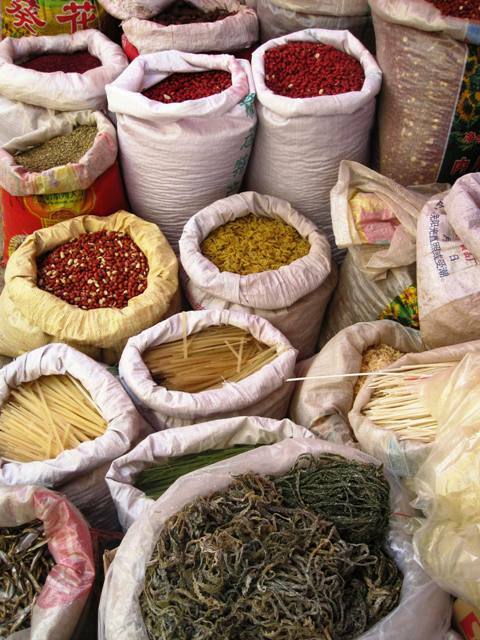 You might not find packs of tea for sale off the backs of mules, but you’ll find pretty much everything else, from spices to fish to human hair. And should you decide you want that molar that’s been bothering you OUT? No worries, they’ve got a dentist, too. Right on the side walk. Just grab a stool and … gird your loins. 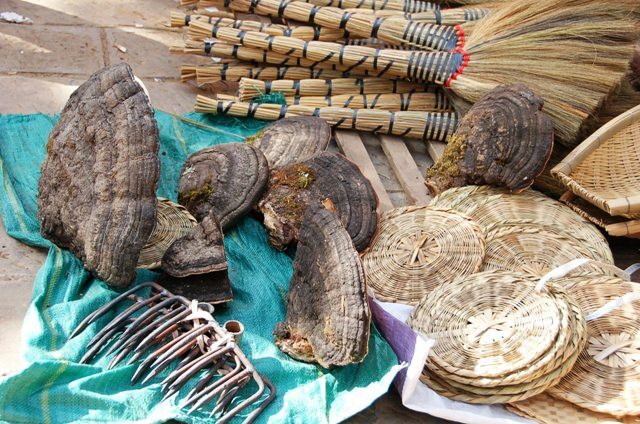 Shaxi Friday Market,: Nothing goes with baskets, brooms and rakes like a nice selection of fungus. 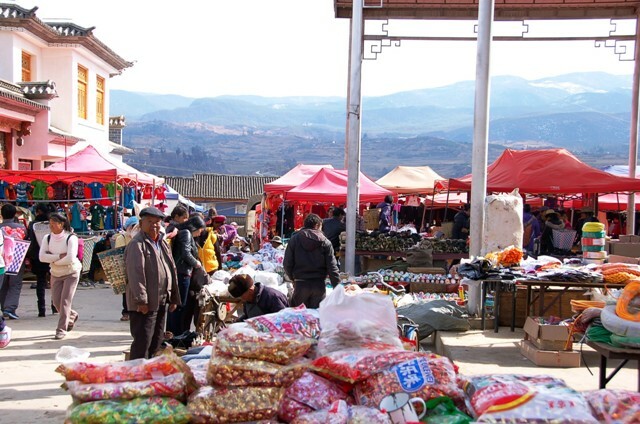 Shaxi Friday Market. A Dentist at Work (Main Road). “Chili Cook Off” has a whole new meaning here! This cutie was so fascinated with Sam. She just stood in the middle of the sidewalk and stared and stared. But when Sam waved, she started screaming and ran off crying to her mom! Also, an interesting point: you see the way her pants are kind of patterned differently in the center? 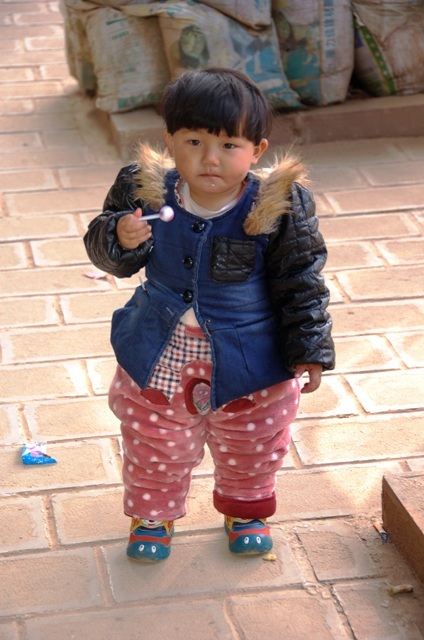 This illustrates the ubiquitous Chinese “split pants” that almost every child under a certain age wear in China. Basically, these ingeniously fashioned articles of clothing are designed so children can just squat and pee anywhere without having to take off their pants. And they do, in fact, go almost anywhere. On the sidewalk, in potted plants, down the stairs of public buildings, wherever. Even if the market doesn’t transport you back in time, then the old town square, which snakes off to the left of the main street market, surely will. 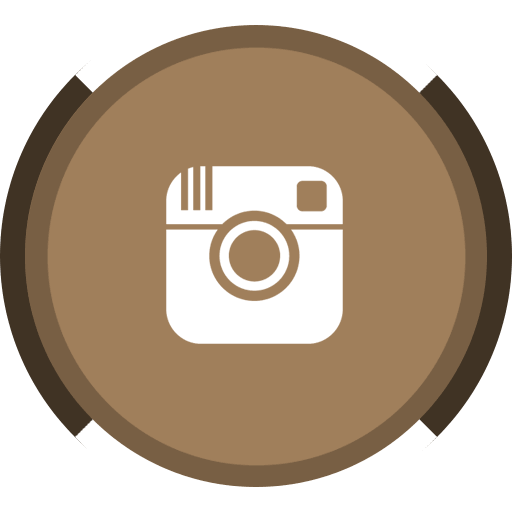 Here, you’ll find crumbling cafe’s, several cozy guesthouses that for whatever reason, do not appear in any of the travel books I’ve seen (there is one guest house on the square that is listed, but all the others are not), and two restored temples that retain their authentic vibe. 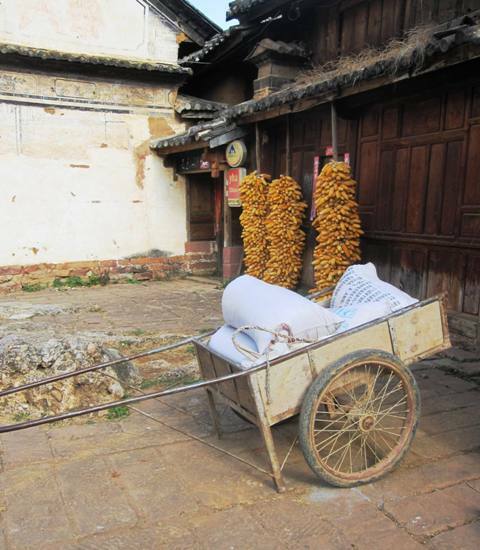 Another bonus of visiting Shaxi is its laid-back feel. 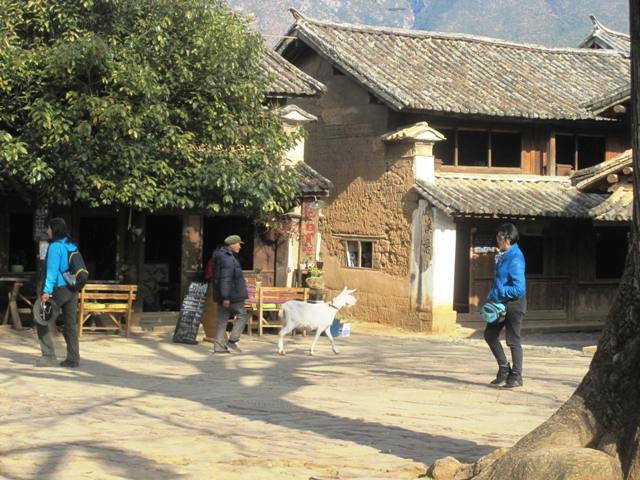 Despite the picturesque surroundings, Shaxi isn’t nearly as touristy as many other places we’ve visited — a somewhat incongruous fact as we read that Shaxi is often used as a setting in many Chinese films. No wonder, too. The old town really has this surreal feeling, as if an old western morphed into a kung fu movie or something. It is quite unique. If you’re coming into town, you’ll most likely enter via the main road. 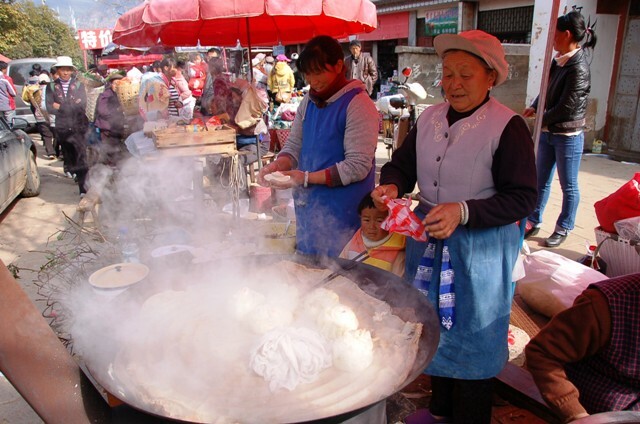 Take a left down the cobblestone side-street to visit the Old Town area and Sideng Square (pictured below). Once at the square, you’ll find alleyways like the one above curling off in all directions. 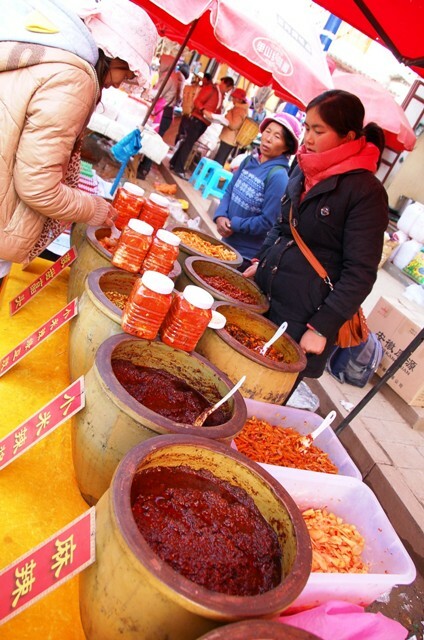 Sideng Square is a great place to grab lunch after browsing the Shaxi Friday market. 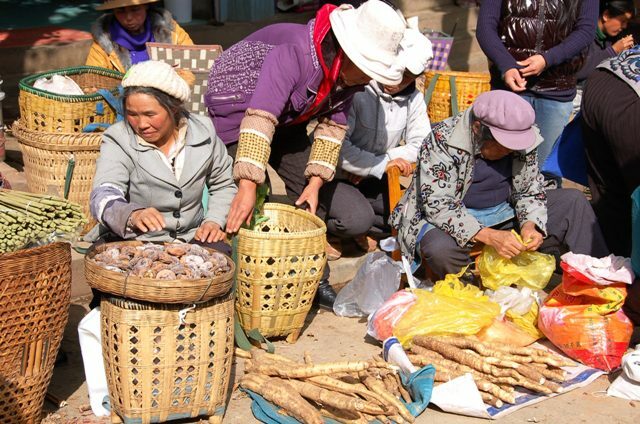 When we went, the area was surprisingly quiet and peaceful — completely different than the bustle at the market. 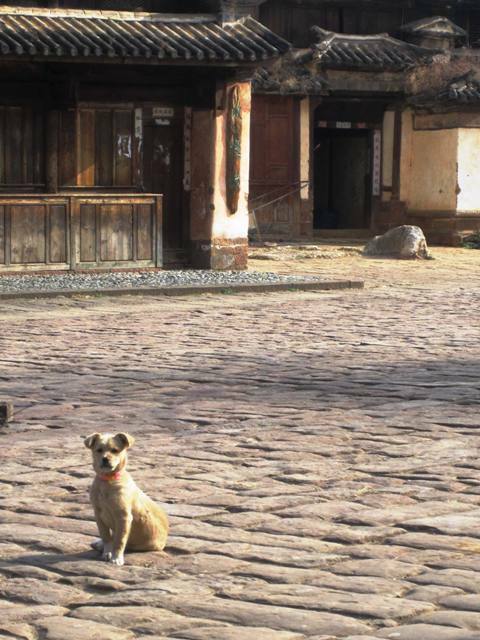 There was one other tourist family at a neighboring cafe, but otherwise, the only people present were the cafe and guesthouse workers … and a few neighborhood pets. 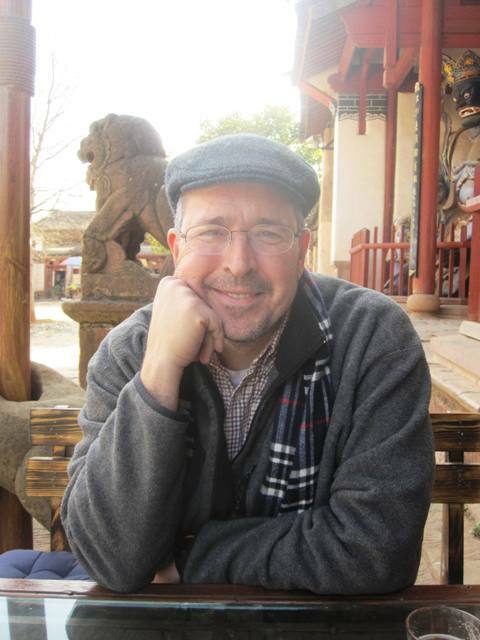 Awaiting lunch at a cafe on Sideng Square, Shaxi Old Town. 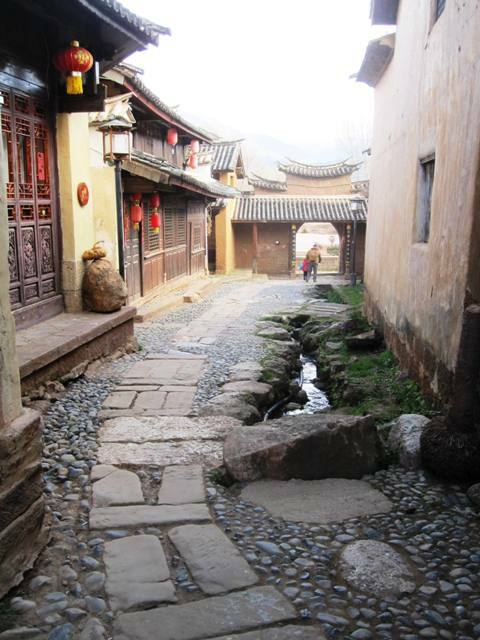 So if you’ve been traveling for a while and just need a place to unwind, Shaxi would be a nice choice. Also? It is said there is excellent hiking in the area (and a cliff-side temple a few kilometers from town that sounds intriguing), although we did not get the chance to avail ourselves of this. 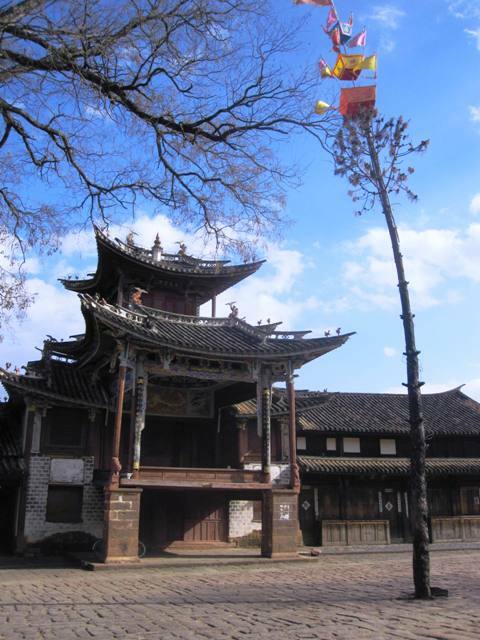 We didn’t stay overnight in Shaxi, but if we have the opportunity to visit Yunnan Province again, we definitely would. 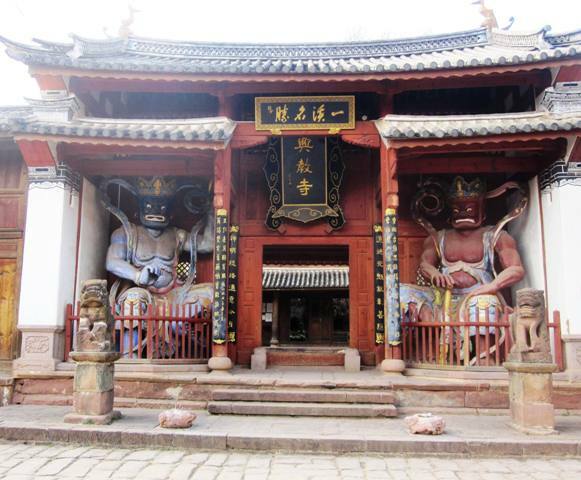 Because Shaxi is off a road that splits from the direct Dali-Lijiang route (Shaxi is point “B” on the map here. 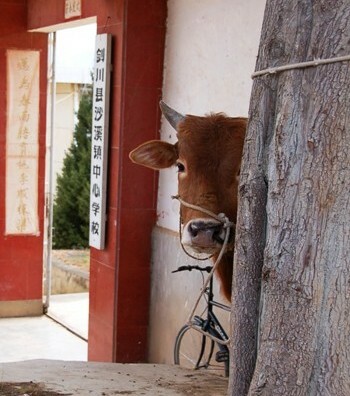 “C” is Lijiang to the north and “A” is Dali to the south), the most efficient way to get here is via private transport. A note on the below map: Dali as indicated by point A is actually the new town, where the train and main bus station are located. Dali Old Town is actually a little north, along the western side of Lake Erhai. Due to time constraints, we chose the private transport option and though it is more expensive than taking the bus, we’re really happy with our experience. Rainbow, our hostess at the guesthouse we stayed at in Dali, helped arrange for a private car to drive us from Dali, stop in Shaxi for 2 to 3 hours, then drive up to Lijiang for 550 RMB. (A little under 100 USD — this included gas). Considering the drive is a bit windy and mountainous, and that the driver would then have to turn around and drive 6+ hours return to Dali, we thought this was an excellent deal. 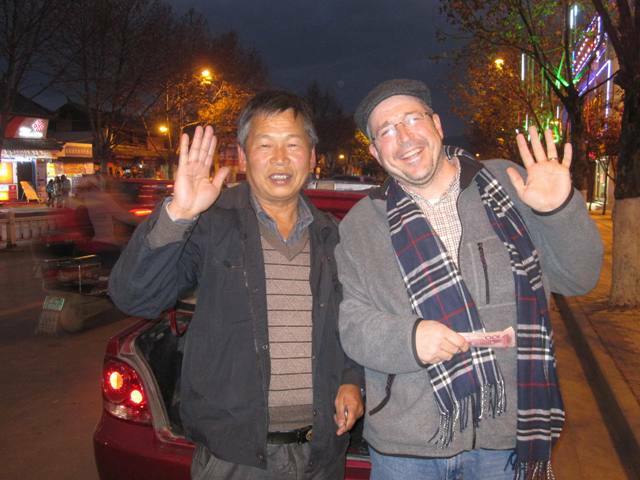 Our driver was really nice, so it made our trip that much more enjoyable. Nonetheless, if you are flexible and have a little time to spare, you can reach Shaxi by bus … you just have to make a switch or two. First, get to the north bus station in Dali. 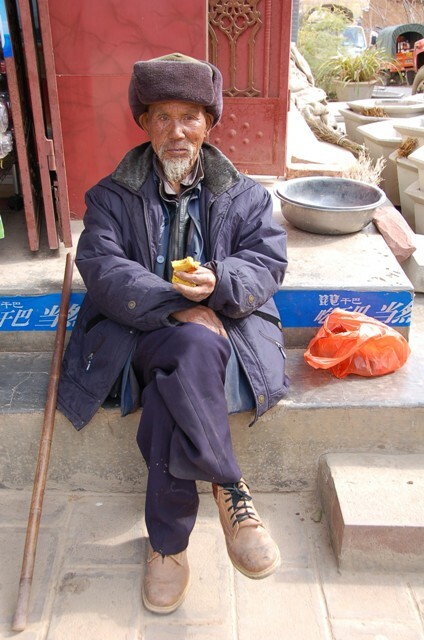 From there, you take a long-distance bus to the town of Jianchuan, which is close to Shaxi. 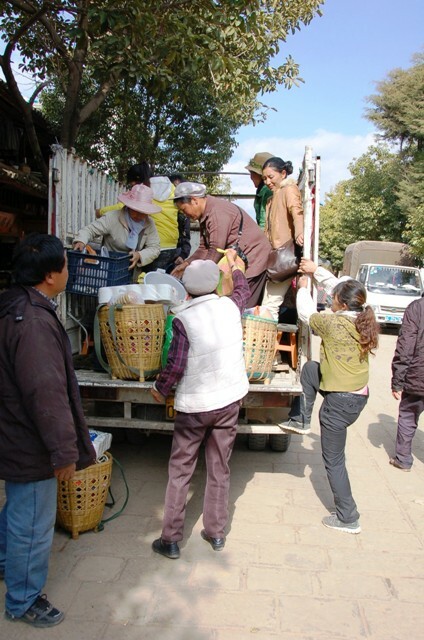 From Jianchuan, take a mini-bus from the Jianchuan bus station to Shaxi. Total trip takes about 4 hours (assuming no delays). 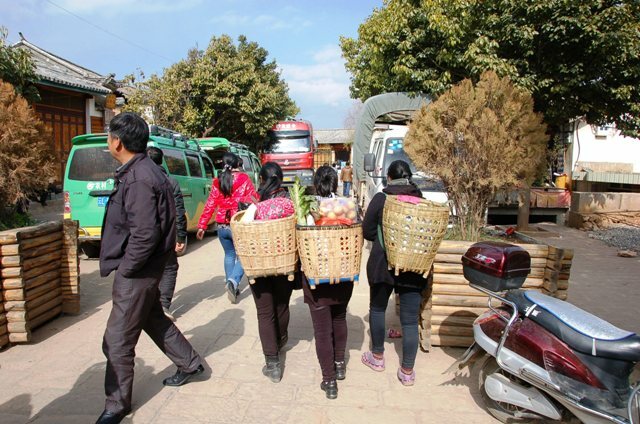 If you are in the Old Town, on the main road by the enormous water wheel, take bus 11 or 8 to the long distance bus station,”Lijiang ke yun zhan.” From there, purchase a long distance bus ticket to Jianchuan. 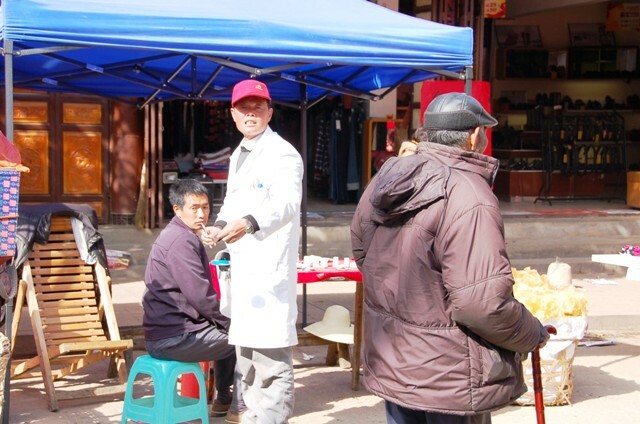 From Jianchuan, take a mini-bus from the Jianchuan bus station to Shaxi. Total trip takes about 3.5 hours (assuming no delays). 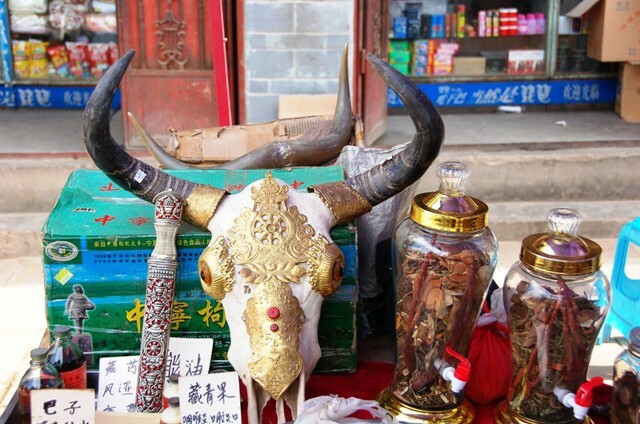 This concludes our road trip to Shaxi, the last preserved, standing market from the Tea Horse Trail days. If you go, it would be best to get there Friday morning, as the market starts shutting down early to mid afternoon. I think we left at around 3:30, and many stalls were packing up by then. In any case, this was one stop on our China tour that we’d recommend completely!